Just point your camera at reality, don't interfere with your subjects, and you will capture the truth. That was a common claim often associated with cinema verité though, to be fair, the filmmakers themselves seldom made such grand pronouncements (mostly just Robert Drew and his closest compatriots in direct cinema, a verité offshoot). American independent director Shirley Clarke clearly had no patience with such rhetoric. The first hint comes in the title of her 1967 mostly-documentary “Portrait of Jason.” Though Jason Holliday appears alone on camera for the entire running time of the film, we are not seeing the real Jason Holliday, only a framing of him, one that necessarily leaves out more than it includes. That's what happens when a filmmaker decides to point her camera at one thing and not another. But the framing began long before the film started rolling because, you see, Jason Holliday was born Aaron Payne and created the character of Jason because it better suited him once he moved to San Francisco. He'll become someone else as soon it suits him too. Jason is African-American, gay, and a self-described hustler and “stone whore” who dreams of one day staging his own cabaret show. Jason may or may not possess the focus to follow through on his ambition but he certainly is a natural performer and gifted raconteur. That's what gave Clarke the idea that Jason would make a great film subject in the first place, and she wanted to concentrate his magnetic pull as much as possible. “Portrait of Jason” takes place entirely over a twelve-hour late night and early morning shoot, recorded in Clarke's apartment at the Chelsea Hotel, in late 1966. Hiding comfortably behind tinted sunglasses and often clutching a drink and/or a cigarette, Jason sings and laughs and cries while recounting a series of anecdotes from a hustling life that's seen him “balling from Maine to Mexico” in his lifelong effort to avoid punching the clock. Whether any of the stories about old loves and crappy bosses are actually true is irrelevant; what matters is how Jason chooses to present himself to the world (by which I mean the camera) and the considerable verve with which he does it. Jason rambles and cracks himself up constantly (credit vodka as co-auteur here) but he can turn a magical phrase every now and then: “If I'd have been a ranch, they'd call me the Bar None.” His picaresque tale about his abusive father known in the neighborhood as Brother Tough is a genuinely great spoken word performance. Jason's mind seems to wander all over the place, but it's obvious he has a plan; the character of Jason Holliday is going to be exactly who he wants him to be. However, Shirley Clarke has a plan too and the film gets really interesting as it turns into a battle of wills over who gets to draw this portrait of Jason. If viewers find themselves veering from admiration to exasperation with Jason, the feeling is echoed loudly by Clarke and her partner Carl Lee, both of whom are heard calling out to Jason from off-camera (like many indie/underground films of the period, “Jason” constantly calls attention to its own methods of production). Jason frequently ignores a request to tell a certain story in favor of what he wants to talk about instead, but it's harder for him to brush off moments when the off-screen prompts turn into bold accusations. Jason puts on a great show, but his interlocutors remind him that he has also hurt many people (including, it seems, the filmmakers) and has never shown regret for it. Jason's inability to muster the slightest bit of sympathy when talking about his mother appears to support their claim. His Jason Holliday is definitely not Shirley Clarke's Jason Holliday. Whatever the “truth” about Jason is, perhaps the final lesson is that the person with final cut always wins. That also makes winners out of the audience as Clarke's boozy, perilous portrait of Jason Holliday remains an indelible one five decades later. You may not love Jason, but you will never forget him. 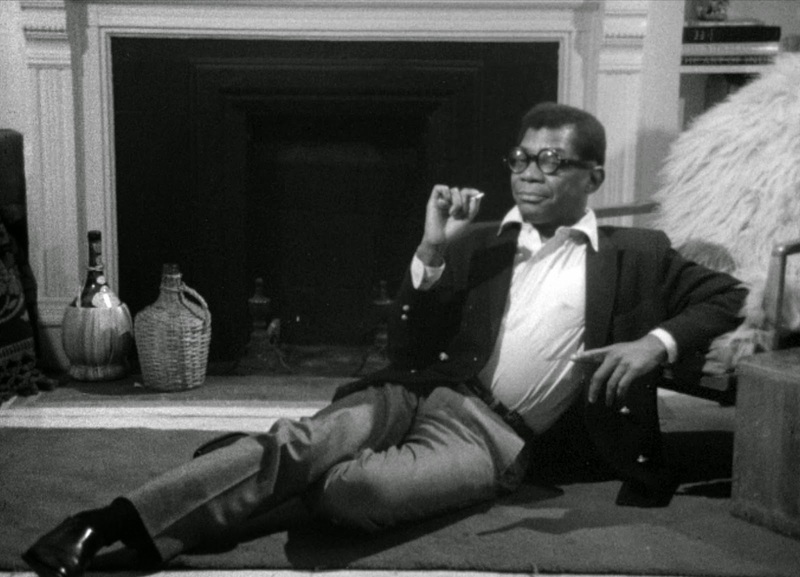 Shirley Clarke had become a major force in American independent cinema with the releases of “The Connection” (1962) and “The Cool World” (1963) and her star was still burning bright with “Portrait of Jason” which was described as “the most extraordinary film I've seen in my life” by Ingmar Bergman. However, she struggled to secure financing for future projects, and produced mostly video shorts until her final release, the feature-length documentary “Ornette: Made in America” (1985). Her legacy became increasingly obscured after the '60s, all but disappearing from chronicles of the American independent scene. I admit I knew virtually nothing about her until this film. Milestone Film and Video has undertaken the ambitious Project Shirley as a means to remedy this oversight. “Portrait of Jason” and “Ornette: Made in America” are the first home-release products of their Herculean multi-year labor (they are labeled Volume 2 and Volume 3 of Project Shirley, but Volume 1, “The Connection,” will follow in a few months). When you see them, you shouldn't have any trouble understanding why Milestone thought the project was worth the considerable effort. The film is presented in its original 1.33: aspect ratio. The “Where's Shirley?” feature included on the disc (see below) tells the complicated tale of how Milestone put together this impressive restoration. “Jason” had been released on DVD from a print at the Museum of Modern Art, but the image was very soft and missing several frames as well as a few minutes of original footage. Milestone scoured the world for better source material and found it and had it restored in conjunction with the Academy Film Archive and Modern VideoFilm. The effort certainly pays off. This high-def transfer is not free of flaws, but it isn't supposed to be. According to Milestone, Clarke wanted a rough look so instead of cleaning up every speck and distortion they preserved a quality very close to what it looked like on its initial release in 1967. The minor imperfections along the way contribute to the film's naturalistic feel and the image quality, while not razor sharp, is a vast improvement over the previously available version. In other words, another great job from Milestone. The LPCM audio mix is similar to the video; it's not flawless but it isn't meant to be. Jason wander sthe frame wherever he wants to and sometimes audio isn't quite as crystal clear as at other times (he trails off sometimes too), but it's never difficult to make out. The off-screen voices are clearly audible too. Optional SDH English subtitles have been provided. As usual, Milestone has turned one of their single volume releases into a comprehensive compendium. “Where's Shirley?” (25 min.) is the kind of feature that makes any cinephile stand up and cheer. Milestone founders/executives/all-around warriors (they even have the wounds to prove they've been in in the fight!) Amy Heller and Dennis Doros appear on camera to tell the inspiring story of their search for Shirley. More specifically their search for a quality negative of “Portrait of Jason,” a search which took them from New York to Wisconsin to Sweden and back again. If you can't appreciate the passion that goes into film preservation after watching this, you're just never going to understand. “Jason in Color!” (2 min.) shows Jason (filmed in color, duh!) lounging in front of a restaurant in New York City circa 1971. “Jason Unleashed” (35 min.) consists of audio outtakes from the shoot. “Jason Before and After” (1 min.) compared a previous version of the film sourced from a restoration by the Museum of Modern Art to the2K restoration Milestone has released on this disc. Let's just say the difference is vast. “Butterfly” (1967, 4 min.) is an experimental short film by Shirley Clarke and daughter Wendy Clarke which played as part of an anti-war program that screened once at NYU. It's a little hard to describe, but definitely interesting. 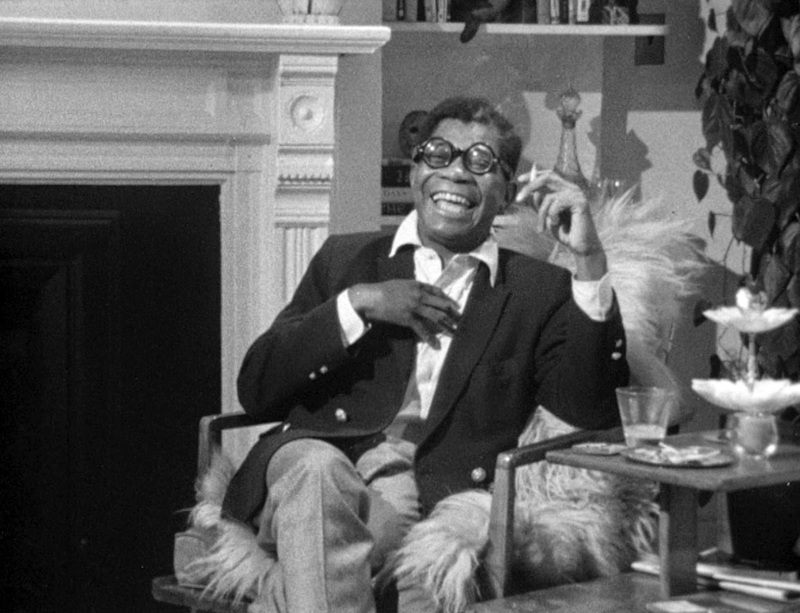 The disc also includes two 1967 interviews: “Shirley Clarke in Underground New York” (10 min., featuring Clarke on screen) and a “Pacifica Radio Interview” (1967, 53 min.) with Clarke (audio only). “The Jason Holliday Comedy Album” (54 min.) was recorded in 1967 but not released until 2007. Maybe that cabaret show was never destined to be an award-winner, but this is still a neat inclusion. 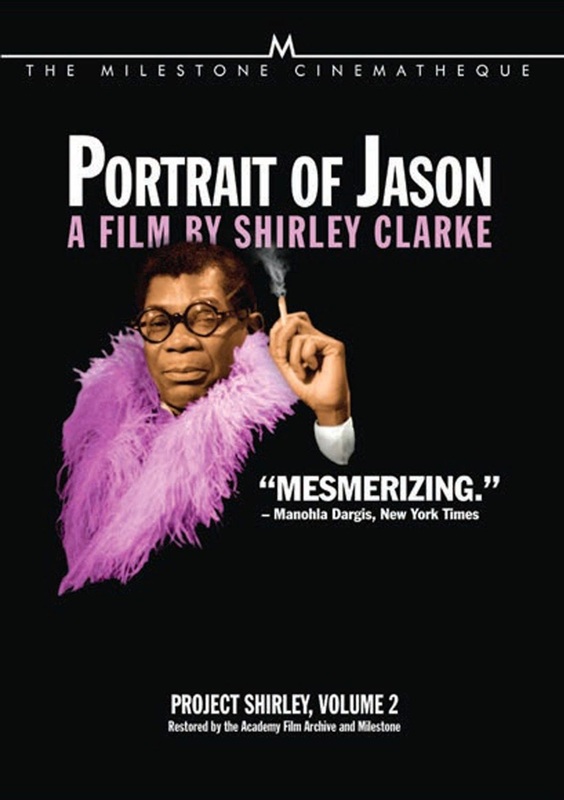 “Portrait of Jason” is a landmark LGBT film and a film that showcases the reflexive, reflective qualities of the best American documentaries being made in that golden era for the field. Jason is neither idolized nor vilified. He mesmerizes, he infuriates, but he never bores. This portrait is as incomplete as any other, but it's completely unforgettable.